The Eastern American toad (Bufo americanus americanus… bufo is Latin for toad) is usually some shade of brown, but colors can vary from olive to tan to gray to red and can change depending on the toad’s surroundings and age. Eastern American toads are short and broad, from two to around four inches long, and have a wide head and short, muscular legs. 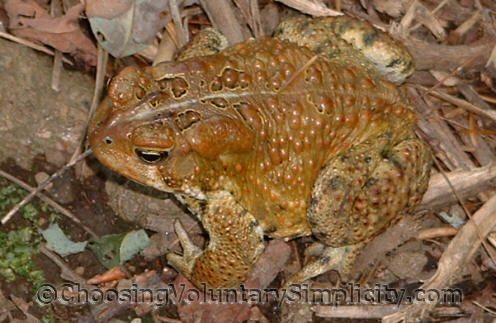 A mature female toad is larger than an adult male, and her skin is much rougher in texture, with more pointed dorsal warts. 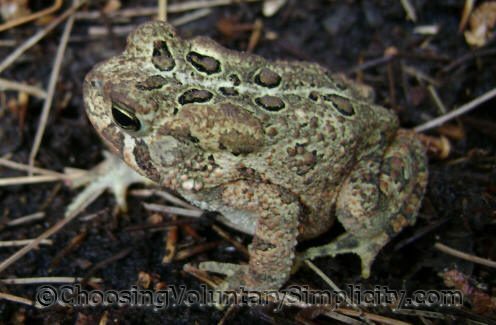 Eastern American toads have chests and throats that are cream or white with spots, although the males’ throats will always be darker. 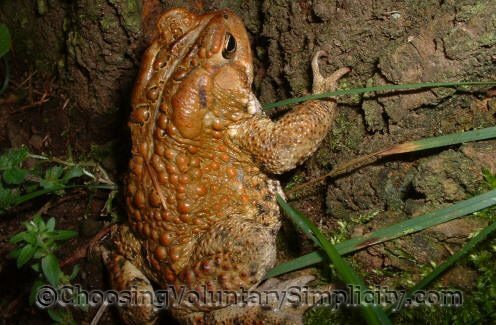 Toads have a very warty appearance, and the warts (raised swellings, not “real” warts) protect them from predators by secreting bufotoxin, an unpleasant white substance that is a mild, foul-tasting poison. The large swellings behind the eyes are the paratoid glands, and in Eastern American toads, the paratoid glands do not touch the raised ridges on the back of the head that are called cranial crests. 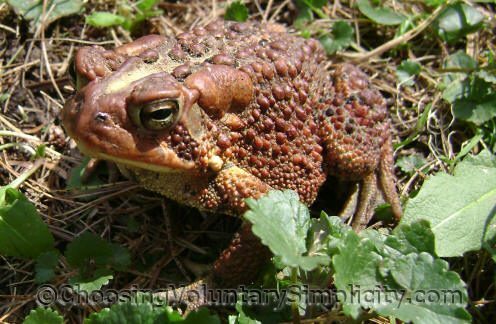 Another identifying factor is that Eastern American toads have only one or two warts in each spot. Other types of toads have more. Eastern American toads breed in April and May in fresh, shallow water. The female lays gelatinous strings of up to twelve thousand eggs that hatch after about four days. The tadpoles develop rapidly and have become toadlets by June or July. 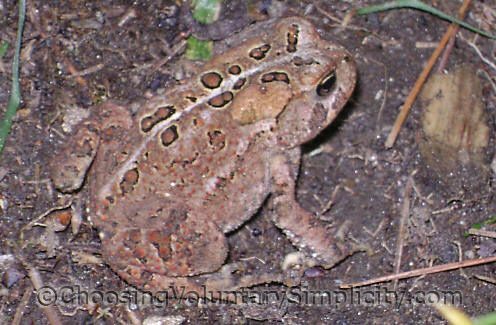 Eastern American toads often stay in one area. They like to be where temperatures are cool and there is loose soil and a food souce. Toads have knobs on their back feet that they use to shove dirt aside. It is quite amazing to see them suddenly sink into the soil and disappear. Toads also hibernate underground during winter. Because we have many toads living in our gardens, we have learned to dig very carefully in the spring. Many times a shovel full of dirt will also often contain a very dopey hibernating toad! This little toad was climbing a tree when I first saw him. He went up the tree for about three feet and then slowly backed all the way down. Toads are often called hop toads because they move in short hops instead of in long leaps as frogs do. Toads are great to have in the garden. One toad eats more than three thousand insects per season, using their hands and arms to push the food into their mouths. Thank you for the information about toads! My son and I found a massive migration of baby toads at a local park. We didn’t know what kind they were and found your site to be very helpful, especially the picures of the tiny northeastern toads. Thank you so much for an incredibly informative site! 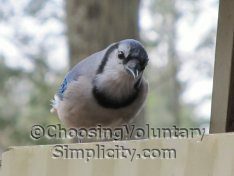 I’ve referenced C/V Simplicity on my own blog, and I hope you don’t mind. I’ll be back–I love your ideas here, and I thank you for the information you provided us on our hunt for the mystery frog/toad in our front yard! I assume that I am among the many who suddenly have a huge number of little toadlets in my yard. We live in a rather rural part of a suburb near Youngstown, Ohio. Behind us is a huge open field with a strip mine lake that probably covers about 2 acres. It is quite deep (over 40 feet at the end nearest our house), and the lake is about a quarter mile away. All our neighbors are also seeing these little guys, and we all hope they’ll stay, but are worried we’ll step on them without realizing. My question is whether or not the lake is the likely source of these little toads. Is this an annual occurrence, or are we particularly blessed this year–as with the 17-year cycle of cicadas? At any rate, they’re adorable and we really like them. How could anyone not love something so cute!?! Hey, your site is informative. But I do have a question. When realizing there were some serious issues in the back of our garage, my father found a very large, Eastern American toad in a drainage pipe. The drainage pipe was installed incorrectly by some do-it-yourself-ers. It turns out the pipe wasn’t long enough to let the water drain properly and ended up allowing the toad inside! It’s obvious the toad is getting ready to hibernate and really loves its home. We’d like to know how to safely relocate the lovely toad to a new home and allow it to winter without stress and trauma. I’d love to have it in my garden or flower bed but what will make it an ideal habitat and one the toad will enjoy? We live in zone 4 and the toads are still active here, so I would think if you just put your toad in your garden, he would find his own place for the winter. Here toads dig deep down into the soil to hibernate. We find them whenever we do any digging in the spring. For next summer you might want to put a toad shelter in your garden… that could be as simple as an overturned large flowerpot with a hole in the side large enough for the toad to enter… or even a short section of drainage pipe! Be sure that your garden has shady areas for the toad. A favorite spot for our toads is under the large hostas or other shade-making plants. Most people don’t realize that the male eastern American toad can climb tall trees. I had just “known” for all these years that the noises I heard in the Spring were treefrogs, but I spotlighted one and it was a toad! They will be ten or 15 feet high. In my area this week there are 4 male toads within a 3 or 4 block area but only one female. Perhaps climbing is a rare thing when females are scarce so that sound might carry further. I meant to say perhaps climbing is rare which explains why it is not a well known fact about toads. It appears to be only the male. I have never heard a female in a tree and the lone female in our area is in my yard near a small pond. If females are scarce perhaps the male will climb.